blog.HalloweenAdventure.com | Latest News from the Costumes Trend FrontLines! : Your Favorite TV Crime Fighters are at HalloweenAdventure.com! Your Favorite TV Crime Fighters are at HalloweenAdventure.com! We don't have to tell you how often Halloween costumes are inspired by movies and television. From the hottest big screen hits to the most popular small screen sitcoms, Hollywood inspires much of what we do and much of what we aspire to become. So, while you may not have exactly what it takes to win the leading role on your favorite TV program or to secure a spot in the hottest films, you can live like a star this Halloween with HalloweenAdventure.com's cool selection of TV and Movie costumes. To give you some idea of how utterly awesome you can be this Halloween, we've taken the liberty of compiling a list of the hottest costumes inspired by your favorite TV law enforcement officers. If you just can't get enough of the seemingly endless and action packed days of Jack Bauer, you're sure to love putting the pieces together and rescuing the helpless in our 24 Agent Jack Bauer adult men's costume. This cool costume includes everything you need to embark on an adventure this Halloween. Rather solve the crime than fight it? No, problem. If you have a strong stomach and a strong determination to nab the bad guys and right the wrong, you'll love our CSI Crime Scene Investigator adult men's costume. Join Catherine, Grisom and the gang, sift through the bloody aftermath, and prepare to dust for prints all night long! Vegas a little too seedy for your taste? Maybe you should move your crime fighting expedition to a more exotic locale! 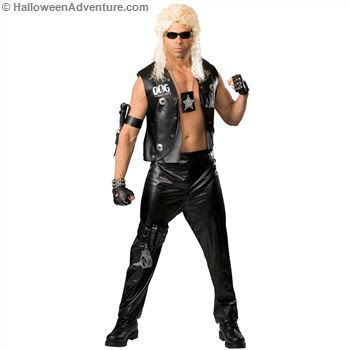 If you prefer to carry pepper spray and dress in black leather, you'll love our Dog the Bounty Hunter adult men's costume. Dog uses common sense and his own eccentric personality to nab the bad guys. Afterwards, he gives them a cigarette and promises them a spot on his team after they've turned their lives around. What a guy! Like your crime fighting a little more traditional? Enjoy wearing short shorts to show off your manliness? 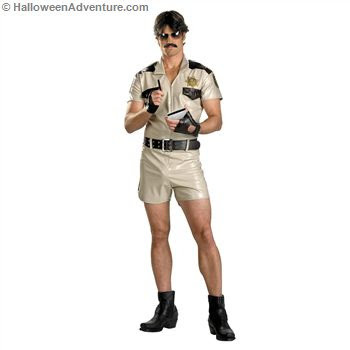 Then move the adventure back to Nevada in our Reno 911 Lt. Dangle adult men's costume. Complete with a uniform AND a "package enhancer", this cool cop is ready for action! Prefer to leave the crime fighting to the professionals? No problem! HalloweenAdventure.com carries an impressive selection of TV inspired costumes from your favorite cartoons and TV programs of the past. Let the Flintstones rock your world, get jiggy with Gilligan, or get your freak on with the Munsters! With HalloweenAdventure.com, the choices are almost endless. From yesterday's coolest sitcoms to today's hottest action packed dramas, the most popular TV characters of all time are at HalloweenAdventure.com!